A Russian naval reconnaissance ship sank in the Black Sea on Thursday after colliding with a freighter. All 78 crew members of the Russian ship were rescued and there were no injuries on the freighter from Togo either, the Associated Press reported. The ship, the frigate Liman, had a hole punctured in its hull and a Turkish rescue ship brought the Russian sailors aboard. 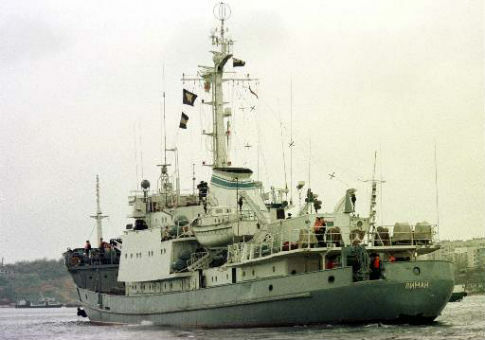 The Russians were then transferred to a Russian cargo ship and are expected to continue on to the Russian navy's Black Sea homeport in Crimea. Russia annexed the Crimea Peninsula from Ukraine in 2014. Before the annexation, Russia had a naval base there for its Black Sea fleet, which it continues to operate. The incident occurred approximately 25 miles northwest of the Bosphorus Strait. The freighter, the Youzarsif H., was carrying livestock. The cause of the collision was not immediately clear, the AP noted. In February, the Liman was monitoring NATO exercises in the Black Sea and had spent much of the winter in the eastern Mediterranean, off the coast of Syria, according to the Interfax news agency. This entry was posted in National Security and tagged Crimea, NATO, Navy, Russia, Syria, Turkey. Bookmark the permalink.